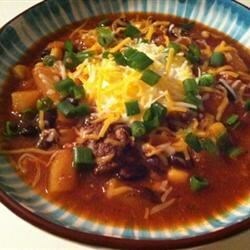 "This sweet and mild chili features lean ground pork with a few surprises. Serve with cheddar cheese, sour cream, and hot sauce to taste. This chili is very mild as is." Cook the ground pork in a skillet over medium heat until completely browned; drain. Combine the cooked pork, tomato, bell pepper, pineapple, beans, kernel corn, tomato paste, onion, baby corn, cider, garlic, brown sugar, salt, paprika, pepper, molasses, ancho chile pepper, sage, curry powder, cinnamon, honey, and vinegar in a large slow cooker; stir. Set slow cooker to High. Cook at least 4 hours. Very good. Has nice sweetness to it. Perfect with a little cheddar cheese melted on top. I'm probably one of the most inept cooks on the planet and this recipe turned out great for me. My daughter is a picky eater and she loved it. This was good...but not great. I have had much better. The pineapple was a nice addition and I might include that in my go-to chili recipe. Note: my 3yo LOVED it!